National coach Mariano Barreto begins his build-up for the 2006 World Cup qualifiers with a training camp in France next week during which he would meet his foreign legion. On Wednesday March 31, at the Le Stade St. Symphorien in Metz, a predominantly Europe-based Black Stars team will play a friendly international with French division one side, FC Metz, currently lying in 16th position in the French championship. The Stars were originally billed to meet German Bundesliga side, SV Hamburg, on March 30 at the AOL Arena in Hamburg. 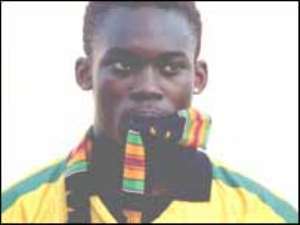 However, the fixture was cancelled at the request of Barreto who was miffed at Hamburg's decision to invite Black Meteors strikers Kwadwo Poku and Bernard Dong-Bortey for trials at a time when Barreto needed them for Ghana's crucial Olympic qualifier against South Africa in Pretoria. The coach felt Hamburg acted in bad faith and against Ghana's interest.Barreto also announced in Kumasi on Monday, two planned friendly internationals against Angola and Portugal. The Stars first meet the Angolans in Luanda on April 28 after which the Portuguese coach leads the team to his home country to play the European championship host team in May. The training camp in France will be Barreto's first date with his foreign legion, and is expected to be one of many training camps in Europe during the Portuguese coach's tenure. A Ghana Football Association (GFA) source indicated however that Coach Barreto might include a few home-based players on the trip to augment the team in areas where his Europe-based players would be unavailable. Since assuming duty in the last week of January, Barreto has concentrated on the Olympic qualifiers and after Sunday's final qualifying match against Zambia, he would turn his attention on the Stars who begin the World Cup qualifiers against Burkina Faso next June.